Phil Guyan dug trenches and cut a hole into the retaining wall to divert waste water overflow away from their home to avoid it seeping into the house. Photo supplied. Imagine waking up to the pungent smell of the neighbourhood’s sewage overflowing into your backyard. 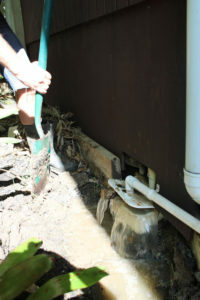 This was the reality for one Pakuranga family who woke on Saturday January 19 to find waste water pouring out of the gully trap on their property, flooding the garden and underneath their home. 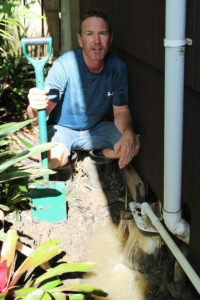 The Guyan family, who live on the lower end of Gossamer Drive directly above the main sewerage pipe for the neighbourhood, spent an entire day trying to prevent their home from flooding with sewage. The only way to protect their home was to dig trenches and cut a large hole into their retaining wall to divert the waste water away. A substantial amount of waste water had already collected beneath their home, while the rest of it poured into the stream behind their house. “It was horrendous and we had absolutely no idea what to do. Faeces and toilet paper were several inches deep. But it took more than 30 minutes to get through to someone at Watercare on their emergency line,” says Annelies Guyan. “We found Watercare extremely slow to react. The first two people who turned up to our house were largely unhelpful and weren’t able to tell us what could be done. The couple say it took less than three seconds to fill a 10 litre bucket. They estimate more than 80,000 litres of sewage came out of the gully trap between 8am and 3pm when the flow finally stopped. Sewage pouring underneath the house. Photo supplied. Guyan says she and her family are furious because they were promised by Manukau Water that yearly maintenance of the sewerage pipe would be undertaken. Guyan says it wasn’t until around 12.45pm when a senior Watercare employee arrived that the family were given any direction or apology. At 4pm, after more than seven hours of constant overflow, a clean-up crew arrived. Guyan says they did a good job, but she was shocked that nobody from watercare was present to oversee the clean up. She and her husband, who know nothing about waste management and clean-up, were responsible for pointing them in the right direction, she says. She said the clean-up crew also needed to remove large sections of infected soil and they are unsure if this will be replaced. Guyan says they were left with sewage underneath their home, and uncertainty over whose responsibility it is to clean it up. Waste water overflowed from a gully trap for more than seven hours, most of which flowed into the stream behind Gossamer Drive. photo supplied. 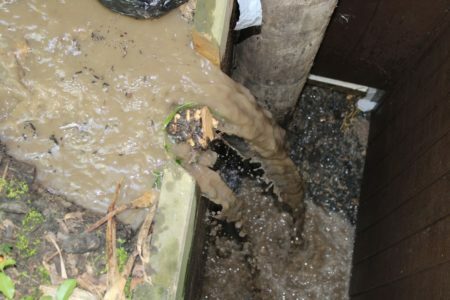 “Watercare are adamant that they are not responsible for the clean-up underneath the house, even though it was their sewerage system that flooded it,” she says. Guyan says she wonders what has been done to ensure the stream behind their house, which flows into the Tamaki Estuary, is safe and free of contamination. When Guyan contacted the Times, Watercare had not been in touch with the family and nobody had been sent to reassess the waste water under the house. Since the Times contacted Watercare, they have been back out to the property and assisted in the clean-up of the underneath of the house. “Unfortunately, an overflow did occur at this property on Gossamer Drive at the weekend. The previous overflow was 10 years ago, in 2009,” says Rachel Hughes, a Watercare spokesperson. “After the resident called us, our crew arrived onsite within 30 minutes. They found the pipe was blocked with rubbish (e.g. sanitary products and wet-wipes) as well as cooking fat. Hughes said Watercare were unaware of any ongoing issues. She says Watercare are unable to calculate the volume of wastewater that overflowed, but say based on the size of the pipe and the low level of ammonia detected, it would not have been 80,000 litres. Watercare carry out routine flushing in areas where there are recurring overflows, Hughes says. Hughes says they will continue working with the community to educate them on the cause of overflows and how they can prevent them.